They had a ceremony next to the field. The beginning of the event "Ningen Shogi" is a ceremony for the win. Until last year(2000), they had it at the monument of Shogi piece on the top of Mt.Maizuru. But this year(2001), they built special altar next to the shogi field. At the "Ningen Shogi", men of professional shogi player play with the game on the 1st day, and 2nd day, women of professional shogi player play with the game. 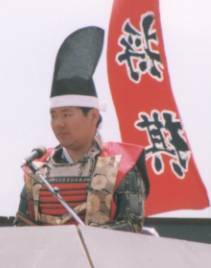 This year(2001), Mr.Takashi ABE with the grade of 7th dan and Mr.Kiyokazu KATSUMATA with the grade 5th dan came to Tendo.. Usually higher rank person performs the Red army and lower rank person performs the Blue army. 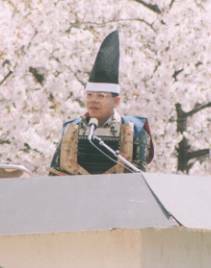 The king performed professional shogi players send directions on the top of a keep tower. I think they saw very beautiful view because the cherry blossoms was in full bloom. Prev. 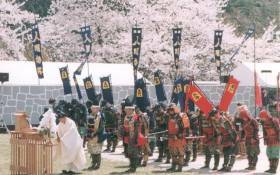 "Parade of Samurai" <Please choose...> Next "Tourist"